You won’t be able to swap batteries in the Leaf in the U.S., but fast-charging stations will cut the charge time to under a half an hour in San Diego. SAN JOSE, Calif. -- The Nissan Leaf. It's blue and you can go from zero to around 40 miles an hour in a few seconds. We got to drive a near-final prototype of the Nissan Leaf yesterday. The all-electric car will be released late next year. A final version of the Leaf was parked on Santana Road in San Jose (see picture). The test drive took place on the top floor of an empty parking garage. Why? The prototype isn't licensed for the streets. Overall, it drove like a somewhat peppy mid-sized sedan, but with the benefits of regenerative braking, quick acceleration and almost none of the noise that you'd expect to find in an electric – think of a Honda Accord or Saab but with extras. Like the Tesla Roadster, the Leaf also has a somewhat clean cockpit. You control the transmission with a knob that looks and operates like a joystick. The camera work isn't glamorous, but check out the video here. Mark Perry, director of product planning for Nissan, also reiterated and refined some of the details surrounding the car. 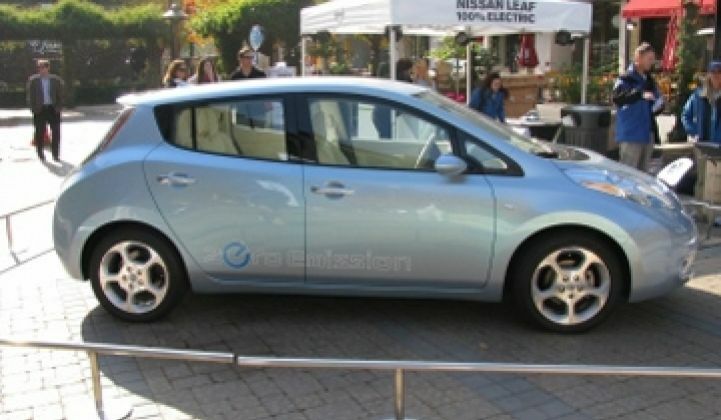 Nissan will start production in September 2010 and start selling cars in December 2010. Perry wouldn't comment on an exact price – that will come in about eight months – but it will sell for around the same price as a well-equipped Altima, or in the $30,000 range. The company is still debating how the sales contracts will work. Customers might buy complete cars outright, or buy the car and lease the battery. Leasing the battery will help ease concerns some consumers have about the durability of the battery. Additionally, by leasing the battery, Nissan can reduce the initial price of the car because the lease agreement can contemplate the $7,500 tax credit buyers will get from the Federal government, he said. Since it is not a rebate, car dealers can't give the money to consumers and collect the $7,500 themselves. Leasing can get around this to some degree. Nissan will not offer battery swapping for the Leaf in America. Instead, it will equip the cars with 480-volt chargers for fast charging. With a fast charger, 80 percent of the battery can be recharged in 26 minutes. San Diego will set up 50 of these by December. Some may be erected in the Bay Area as well.